Rashmi Kathuria is innovative and passionate Mathematics and ICT teacher working in Kulachi Hansraj Model School, Delhi, India. She believes in exploring, learning, collaborating and sharing. 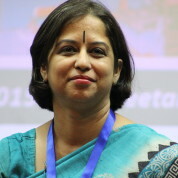 Her website http://rashmikathuria.webs.com is full of enriching Mathematics resources and teaching learning ideas. She was among Top 50 Global teacher prize finalists and has received two Presidential awards and many accolades as a teacher. She is Google Certified Teacher and innovator and has Conducted/ Conducting workshops for teachers on using technology in education, creative teaching learning strategies etc in India and abroad. She writes blogs for Top Global Teacher Bloggers for the series Global search for education. She is international activity coordinator in her school and her school was awarded with ISA 2014-17, ISA 2017-20 from British Council. She is working as a coordinator for School Enterprise Challenge which focusses on building entrepreneurial skills in students and has developed (http://khmsudaan.blogspot.in). Her school got Top Global Prize 2014 of 5000 dollars , Business Development Prize 2015 of 1000 dollars and Enterprising student 2016. Her success mantra lies in "Success lies in doing efforts and enjoying whatever you do." Ms. Monalisa teaches computer science to students of grades 7 and 8 at KHMS. She is passionate about exploring, learning, collaborating and sharing.